Genuine OEM Dell Toner Cartridge, Magenta, Extra High Capacity 9,000 page yield. Dell part number: 331-8431, XKGFP, 40W00. Color Laser Toner Cartridge compatible with Dell C3760dn, C3765dnf. Compatible Dell Toner Cartridge, Magenta, Extra High Capacity 9,000 page yield. 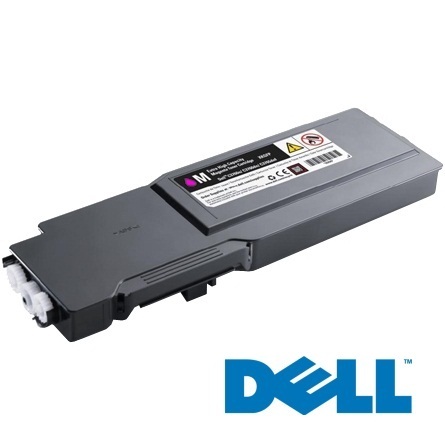 Replaces Dell part number: 331-8431, XKGFP, 40W00. Color Laser Toner Cartridge compatible with Dell C3760dn, C3765dnf. Compatible Dell Toner Cartridge, Cyan, Extra High Capacity 9,000 page yield. Replaces Dell part number: 331-8432, 1M4KP, FMRYP. Color Laser Toner Cartridge compatible with Dell C3760dn, C3765dnf. Compatible Dell Toner Cartridge, Yellow, Extra High Capacity 9,000 page yield. Replaces Dell part number: 331-8430, MD8G4, F8N91. Color Laser Toner Cartridge compatible with Dell C3760dn, C3765dnf. Remanufactured Dell Drum Unit, Cyan, 60,000 page yield. Replaces Dell part number: 331-8343C. Drum Unit compatible with Dell C3760dn, C3765dnf. Remanufactured Dell Drum Unit, Magenta, 60,000 page yield. Replaces Dell part number: 331-8343M. Drum Unit compatible with Dell C3760dn, C3765dnf. Remanufactured Dell Drum Unit, Yellow, 60,000 page yield. Replaces Dell part number: 331-8343Y. Drum Unit compatible with Dell C3760dn, C3765dnf. Remanufactured Dell Drum Unit, Black, 60,000 page yield. Replaces Dell part number: 331-8343K. Drum Unit compatible with Dell C3760dn, C3765dnf.